STOUGHTON, Mass. – Sometimes it all just boils down to the ability to finish. Oliver Ames was able to do that in the second half on Friday afternoon and picked up a 3-1 road win over Stoughton to improve to 4-0 on the season. After a back and forth scoreless first half that saw few spells of substantial possession from either side, the team’s combined for three goals in the first six minutes of the second half. It took the Tigers just over a minute to get on the board in the second half. A long throw from senior Max Ahern into the area that was deflected on by junior Thomas McCormick. The ball found it’s way to the feet of senior Keegan Nutt right at the six-yard line and he buried the chance to make it 1-0. But Stoughton responded quickly, netting the equalizer less than three minutes into the half. After a foul roughly 40 yards away from goal, Stoughton senior captain Josh Mitchell stepped over the ball. Mitchell had a go from distance and with the sun directly in OA goalie Jack Carroll’s eyes, Mitchell’s bid sailed just under the bar to tie the game at one. 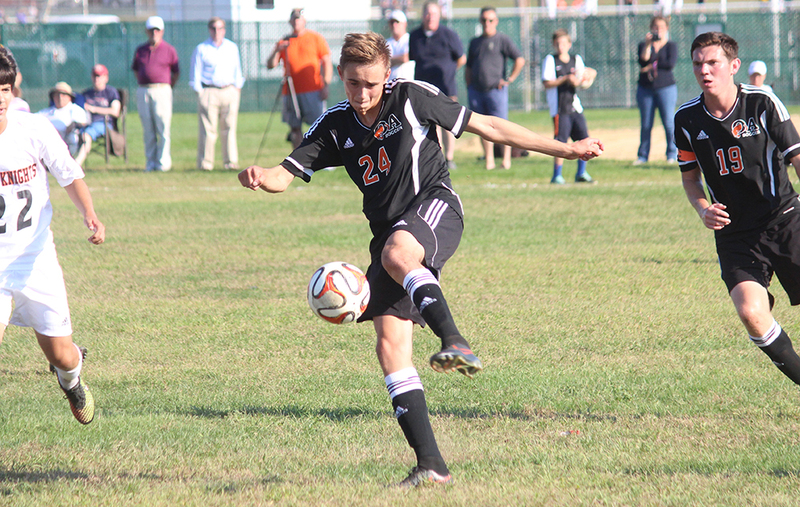 But just three minutes after that, Oliver Ames earned another chance on goal. At the top of the area, Nutt was able to evade a defender but was brought down after doing so to earn a penalty kick. Nutt took the chance, placing it into the bottom right corner. Stoughton goalie Kyle Silverman went the right way and even got a hand to it, but Nutt’s placement made it nearly unstoppable. It looked as though Stoughton might knot the score once again less than two minutes later. Sophomore outside back Brian Peoples connected with junior Loubensky Lucas, who laid a pass off for senior Winston Kessah. Kessah hit a one time shot to the top corner of the near post but Carroll leaped up and punched the shot away and collected the rebound. Just under 10 minutes later, Oliver Ames was able to add an insurance goal. Nutt picked up the ball just over midfield and found sophomore Mason Galbato. Galbato carried to the middle of the pitch before laying it off for senior Chris Romero. After dishing the ball off, Galbato continued his run and Romero found him right back with a through ball sending the sophomore in on goal and he buried it into the back of the net. Both sides had dangerous chances in the first half but couldn’t convert. Just over six minutes into the game, OA sophomore Matt Campbell tracked down a ball along the right wing. After a couple of touches, he laid a pass back for sophomore Cam Vella who ripped a shot at the near post by Silverman got there and pushed it wide for a corner. Stoughton’s best chance came shortly before the halfway mark of the fist half. A loose ball bounced up for freshman Fabio Ponce De Leon but it was an awkward bounce that he was unable to get over and his shot sailed high. OA nearly got on the board just two minutes later when Nutt chipped in Romero behind the defense but Silverman was out to thwart Romero’s header. Stoughton didn’t get any serious chances in the final half hour of play, which is a credit to the adjustment Barata and his staff made the break. The Tigers elected to drop center midfielder Nathaniel Cardoza a little further back as the back line was forced to deal with the sun in their eyes. Stoughton drops to 1-2-1 overall but were the first team to find the back of the net against OA this season. 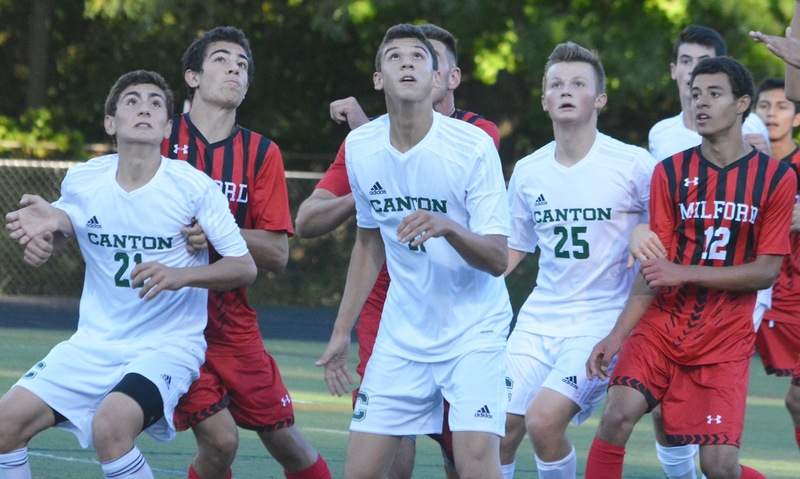 Oliver Ames will look to continue its perfect start when they host Canton on Monday. Stoughton will look to bounce back when they travel to Sharon on Monday.